"I recently came across my maternal Grandma's recipe book, printed in 1933. In it, I came across a piece of paper, placed between two pages, containing her version of Bakewell tart. I have not changed the recipe and it makes a delicious tart, which I remember her making for Sunday afternoon tea. The tart does not have to be blind baked first before adding the filler. I apologize for the poor photo but the family started tucking into the tart before I could photograph it. Serve with cream, ice cream, or custard. It will bring a smile to your face." Combine all-purpose flour and 9 tablespoons butter in the bowl of a food processor; pulse until they resemble bread crumbs. Add water and salt. Mix, adding 1 teaspoon water at a time as needed, until a dough forms that's not too wet and sticky. Shape into a ball, wrap in plastic wrap, and refrigerate for 30 minutes. Preheat oven to 400 degrees F (200 degrees C). Grease a 7-inch loose-bottomed tart pan. Combine 7 tablespoons butter and sugar in a large bowl; beat with an electric mixer until smooth and creamy. Add self-rising flour, eggs, ground almonds, milk, and almond extract and mix well. Roll dough into a thin round on a lightly floured work surface. Press around the rim of the tart pan and trim off excess dough. Cover dough with raspberry jam. Spoon in almond filling and smooth out top with the back of a spoon. 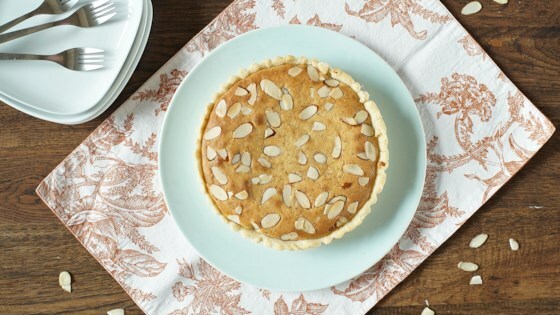 Sprinkle sliced almonds over the top. Bake in the preheated oven until top of the tart is a nice golden brown, 25 to 30 minutes. Remove from oven and place on a cooling rack to cool, about 1 hour. Remove pan when tart is cool and place on a serving plate. Biggest issue was that my sponge was dry. Other than that its great. Just need to work out how to moisten the sponge.